Evelyn loved to come to Primary. She always raised her hand to say prayers. She also loved to help her teachers. But today was Evelyn’s first time giving a talk. As she walked to the front of the room, her stomach felt wiggly. Then her heart started to beat fast. Thump-thump. Thump-thump. Thump-thump. Evelyn told the Primary children about the white dress she wore. The temple was very white too. She told them that she and her parents and sister were sealed together forever. Evelyn sat back down. She felt happy. It felt like a warm light was shining through her body. She was happy she went to the temple. Evelyn talked about being sealed to her family in the temple. 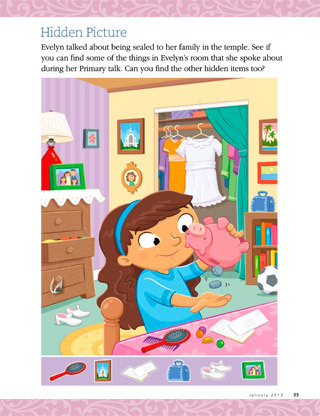 See if you can find some of the things in Evelyn’s room that she spoke about during her Primary talk. Can you find the other hidden items too?